If you are a dog that has been mistreated, it is good to have a buddy like Brains. Or so they call her at Palm Beach County Animal Care and Control that is temporary home to the pair--Brains and Brawn. The dogs were first spotted making their way through traffic--but 30-pound Brawn was dragging a 20-pound chain that had been tied around his neck. When Brawn would slow down, it looked like Brains would encourage him to keep going. Somehow, he escaped from the cruel environment he was living in, and this sweet girl was helping lead him to a better life. Dianne Sauve tells WPBF.com, "The female appeared to be leading this poor other dog who apparently is a friend of hers -- you can tell they're friends -- leading him away from wherever they came from." I sure hope these friends can find a forever home together. Only they know what really happened that day, but they got through it together. 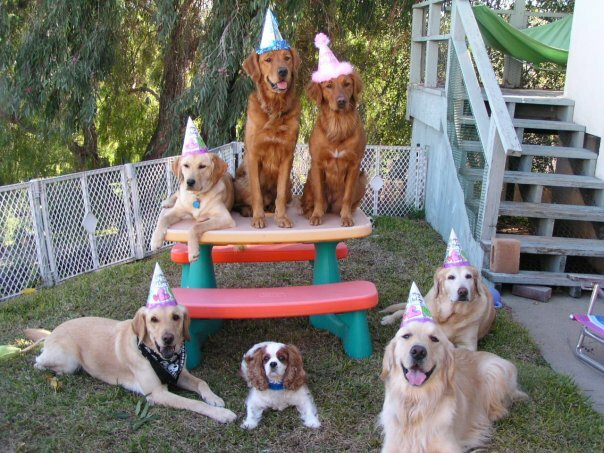 Today is my one year anniversary of being a blogging dog--That is seven years of blogging in my world! Nearly 350 stories later, I am still in business. It has been quite an exciting year. 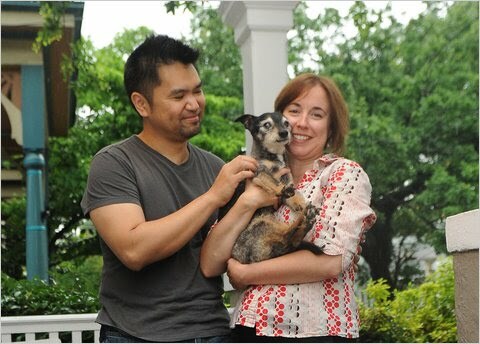 I have made some great friends online and off--even traveling to BlogPaws, the first ever conference for pet bloggers! My very first story was Commuter dogs --about the dogs of Moscow riding the train and working in packs to avoid missing a stop. I later did a follow up story on the Strays of Moscow. The biggest dog EVER--about Giant George, the 245 pound great dane. The dog lady's Chain of Hope--the story of Kate Quigley, who travels the roads of Kansas City helping out dogs that need her. 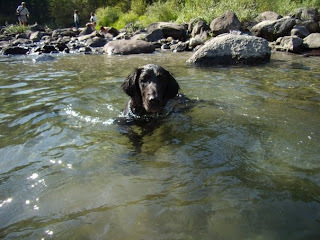 Give this dog a JOB!--about my buddy Baxter, a working dog who is STILL in need of a home. Prosthetic paw has Sully running again--about how new technologies are changing the lives of dogs with disabilities. Search and Rescue dogs in Haiti--about the hard working dogs to lending a paw to help find people trapped after the devastating earthquake. Glamour Pets--Glamour magazine's April fool's joke was a hit among pet people. Are dogs Republican or Democrats?--profiling famous dog lovers on both sides of the aisle. Rescue overload--when to know when you have taken on too much. I want to send a BIG WAG out to all of my loyal readers--without your support, feedback, comments, and clicks, I would have given up a long time ago. But here I am, looking forward to the next seven years! What is fostering all about? I got a rough start on the streets of North Carolina, but I was lucky enough to land in a foster home on my way to finding my forever home. Having a foster home meant that I could live in a home instead of a shelter, where I could get used to things like people, doorbells, stairs, peeing outside, peanut butter, toys, and all the other comforts of a real home. Some dogs could use foster homes because they really need the TLC that would come with living full time with a caring person. Cash strapped shelters with dozens, or even hundreds of dogs, just don't have the resources that some dogs need. 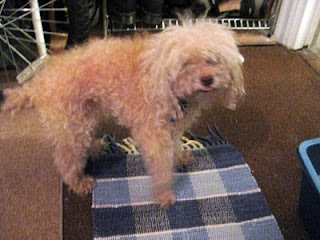 Alvin, for example, was not looking so great when he landed a temporary home with Jane, a volunteer with Waggytime Rescue in New York CIty. Jane knew there was a great dog under the dirty matted coat, and she wanted to help Alvin shine. Posted here are the before and after pictures of Alvin-look at that smile and bright eyes, a face full of expression, that you just couldn't see before. I bet feeling clean and cared for has a lot to do with the smile you see in that picture. Jane really has done a fantastic job helping Alvin put his best paw forward as he looks for his forever home. 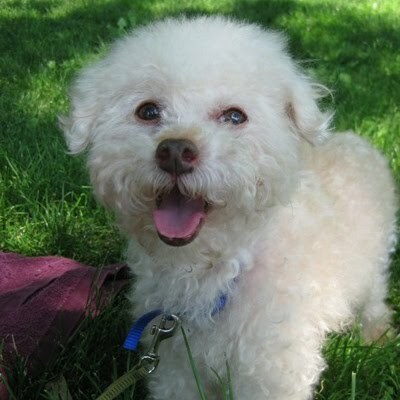 You can see more pictures of Alvin here on his petfinder page. According to his profile, "He loves sitting on laps, flopping over on a comfy couch and "dancing" for chicken treats." Seems like life has really turned around for ALvin since landing in foster care. And YES, he is still looking for you! If you are thinking about fostering, you should know that there are all kinds of dogs out there that could use your help. Some need some help coming out of their shell, some need a bath, and some just need a warm place to crash on their way to their forever home. I love my home now, but I know that if it were not for the several foster parents I had through Homeward Trails Animal Rescue, I would not have the good life I have now. Ingrid (pictured here) is a cheery pit bull terrier that landed in the Little Shelter Animal Rescue and Adoption Shelter two years ago with a severe heart condition and a variety of other ailments. The good folks at Little Shelter were going to do whatever it took to get this sweet girl back in good health, even if it meant giving her Viagra. Wait, WHAT? Yes, vets say that Viagra increases the blood flow and keeps Ingrid's heart healthy. Viagra, at $10/day, is not a cheap medication for any cash-strapped shelter. Little shelter is now asking for charitable folks to come forward with some spare pills from their last prescription. According to LA Times Unleashed, "One woman donated her husband's stash to the dog because she suspected he was having an affair." Hey, whatever works. According to the NY Daily News, Ingrid came to their shelter two years ago, and they launched a very successful Viagra collection, but that supply has been almost completely depleted. Ingrid is still looking for a home that can support her Viagra needs. With a daily little blue pill, she is expected to live a long normal life. 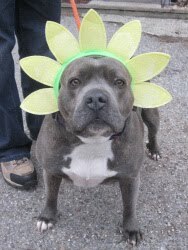 Contact Little Shelter in Long Island if you have some spare pills, or room for a sweet bully. NY Daily News has another beautiful picture of her here. While the treatment isn't yet mainstream for dogs, who'd have thought that female dogs like Ingrid would get their paws on Viagra before human women? FDA is currently considering extending Viagra availability to women, in fact, the Reproductive Health Drugs Advisory Committee meets today to discuss the "little pink pill." James Beavers is a homeless veteran living in an abandoned car wash. It sounds like life had let him down in more than one way, but James still has compassion. After being startled by a car speeding away, he heard a dog wimpering. 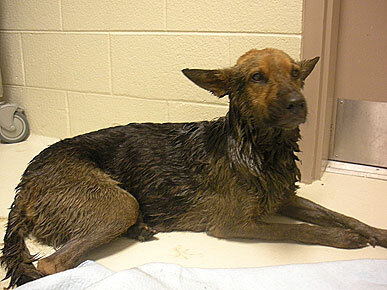 He searched the area and found the dog in the worst possible place for a dog: in a abandoned vat of disposed motor oil. He found some rope to pull the dog out of the mess, but still needed help making sure the German Shepherd mix, who had recently had puppies, got cleaned up. He went to a nearby pay phone to call his friend Sheila Zachar, who has taken to animal rescue since retiring. 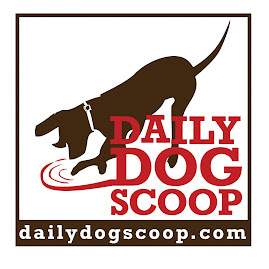 Covered in toxic goop and stagnant water, the dog needed to get emergency care. Luckily she was saved by James before too much of the oil had been ingested, so most of the care she needed was some extra vigorous cleaning. The incident was reported on the local news, and a family desperately looking for their dog came forward--Harley had been stolen from their front yard. 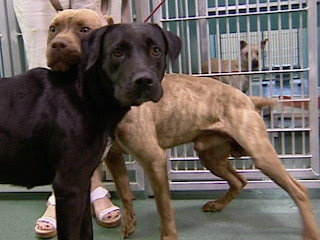 The Humane Society of Memphis and Shelby County has given the family some tips on safeguarding their dog from danger from neighborhood menaces, and has also taken Harley's five puppies. They will spay and neuter them, and then work on finding homes for them. No word on if anyone is helping to find a home for the real hero of the story: James Beavers. 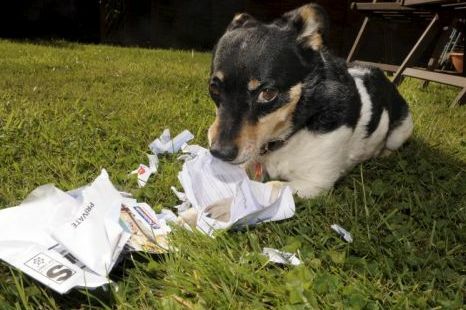 Toby doesn't just fetch the paper... sometimes he eats it! Aside for generally inconveniencing his people so that they have to find their news elsewhere, this hadn't been a huge problem. One day his owner Gill Bird came home and Toby wouldn't even pick up the chip she tossed to him for a snack. Then she noticed he was drooling and blowing bubbles from his mouth. Upon further inspection, she discovered that Toby's mouth was basically glued shut from the paper he was chowing on. She couldn't even part his jaws herself, and had to take Toby to the vet. Once there, he had to be sedated while the nurse and doctor scraped the paper-turned-glue from his mouth. The vet described it as a "very unusual case." I'd say so! Toby was home by the end of the day and back to normal. He is pictured here flossing with the bills. Metro.co.uk has another picture of Toby's jaws caked together. I would never call my person "just a person." She is MY person, and she is a special and irreplaceable part of my life. But plenty of people refer to me and my four legged friends as "just a dog." I feel bad for those people because they only think that because they have never had the chance to share their life with a dog. My friends over at Life with Dogs have put together this beautiful video to explain this phenomenon it to others. They explain that some of a human's happiest and saddest moments can occur with or because of "just a dog." Sometimes "just a dog" will provide the comfort that no one else could give. Of the other beautiful things in your life, would you say "just a promise" "just a friend" or "just a sunrise"? We would never say that about our own person or anyone else's person. My cousin Lily is pictured here. Her smiling face, giant tongue and sweet sweet temperament make her so much more than "just a dog" to my grandparents. Let your dog escape once they go in. Let your dog decide they are done for the day. Try using toys/food as a bribe to get in, BUT be sure to REWARD (more treats/play) AFTER the dog gets in even if they pop out. Use really, really tasty treats or your dog favorite toy. Start with a shallow pool and clear water with no waves or spray. The most important thing to keep in mind is that you need to make it safe and fun, but if your dog just isn't interested in swimming, that is ok.
My cousin Madison LOVES to swim, and she is pictured here having the time of her life in the Wenatchee River in Washington State. Madison has some joint problems, so regular swimming is a great way for her to get some exercise without putting extra pressure on her knees and hips. Plus, she thinks it is fun, which is the most important part. I admit it, I have gotten caught up in the thrill of participating in Adopt a Shelter Cat month. Last week, I told you about my good friend Pimp from YourDailyCute, but I have another buddy to tell you about: Romeo the Cat--pictured here. In addition to his hilarious daily campaign to make sure his BREAKFAST is served on time by his staff, Romeo uses his platform to raise money and awareness for cats in need. Please check out his fun blog! Sushi is diabetic and needs some dental attention. Tiffany has a heart murmur and needs to visit a specialist. Einstein a beautiful senior cat--dumped at 17--and is suffering from an ulcerated eye that will require a specialist. Romeo knows all about this journey. When he was in a shelter, he was deaf, but after he was picked up by The Forgotten Persian Rescue and Friends he had a series of surgeries, he can hear just fine now. He does have a permanently folded ear, but I think that makes him extra cute. Romeo has gone on to be a successful blogger, with the support of his very capable staff member, Caroline Golon, who is the founder of BlogPaws! Some humans might need to take a lesson from dogs to improve the relationships in their lives. I am always thrilled when my person comes home, even if she was in a terrible mood in the morning. I just think she is so wonderful, why wouldn't I be thrilled to see her? Well, some people don't get the same reaction from their spouse or partner, according to clinical psychologist Suzanne B. Phillips. In a recent article in PsychCentral entitled "Can Pets Improve Your Relationship? ", Phillips uses examples of how people react to their pets to show how they should also consider treating their human partners. For example, you may be upset or a little mad after a shoe gets eaten or curtains are shredded, but people rarely hold grudges for their pets mistakes. Check out the whole article for perspective on greetings, expectations, acceptance, holding grudges, assuming the best, and for better and for worse. Image courtesy of NY Times Well Blog, where I first read about Dr. Phillips' article. 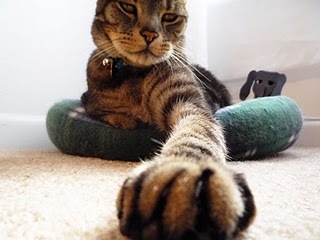 Being a dog, I like to focus on dogs in the news, but June is Adopt-A-Shelter-Cat month, so I figured I should lend a paw to promote the cause. Like dogs, too many cats end up in shelters by no fault of their own, so please consider adopting if you are looking to bring any pet--cat, dog, ferret, parakeet--into your home. Petfinder has over 125,000 cats available for adoption on their site--so I am sure you could find just the guy you are looking for! 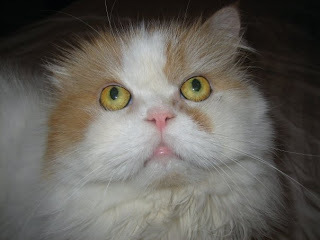 Petfinder is promoting Adopt-A-Shelter-Cat month though their Whiskers photo contest. They have lots of categories, including "Best Duo"--and I hope an adoptable cat-dog pair wins that one to spread the word that sometimes dogs and cats CAN get along--like Smiles & Amie who were seeking to land a home together. Or the boston terrier and cat cuddle action in this youtube video below. 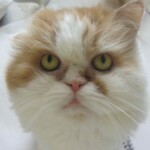 If you can't adopt, but are looking for your cat fix, check out YourDailyCute.com for mostly cat-related cuteness. Pimp the former shelter cat is the inspiration behind YourDailyCute, and he is pictured above demonstrating how to achieve ultimate cuteness with the classic "outstretched paw" move.